Not every board game is about fighting wars or ripping off your friends. There are games out there that are about changing the world – including the four below that we made! 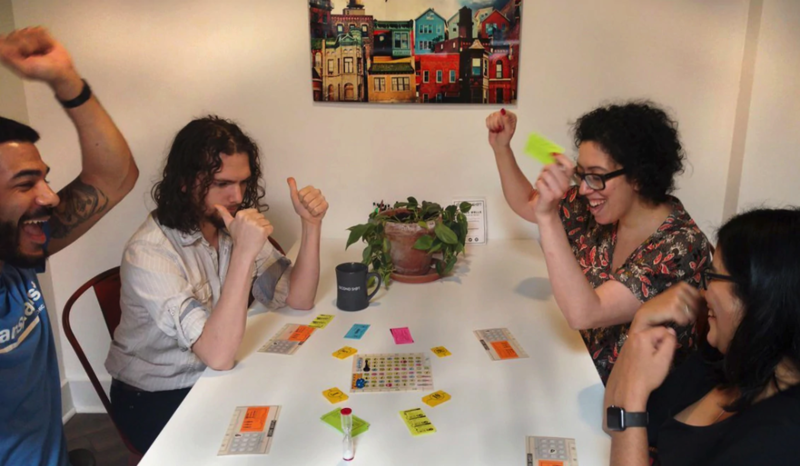 If you want your game night to reflect your values, these games will make people laugh, think, and strategize together about how we can build something better. 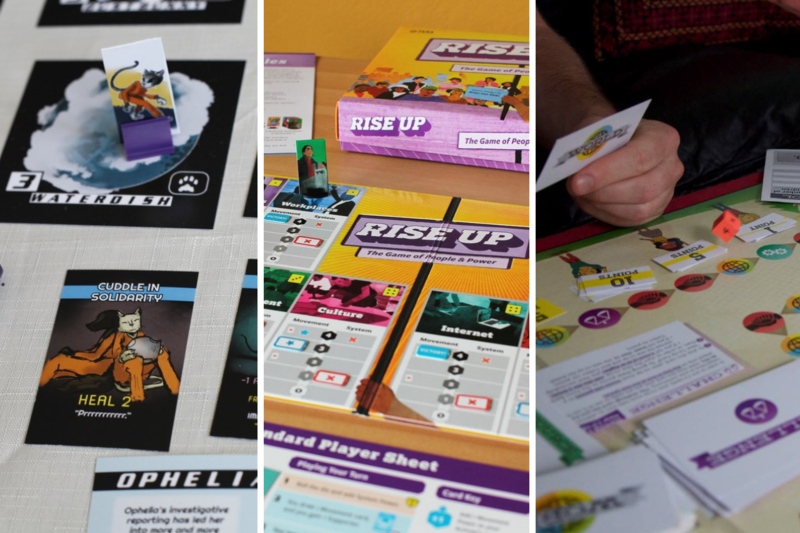 Rise Up: The Game of People & Power is the game about fighting for what you believe in. At the start of each game, players come up with any movement they want to build, and then the story of their movement unfolds as they play. 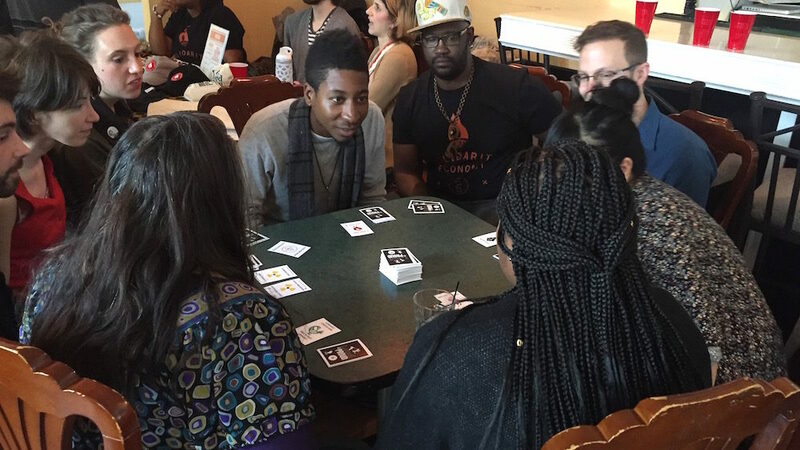 Using cards like “Massive March,” “Protest Song,” and “Building Community,” players will launch a campaign to bring about the change they want to see in the world. 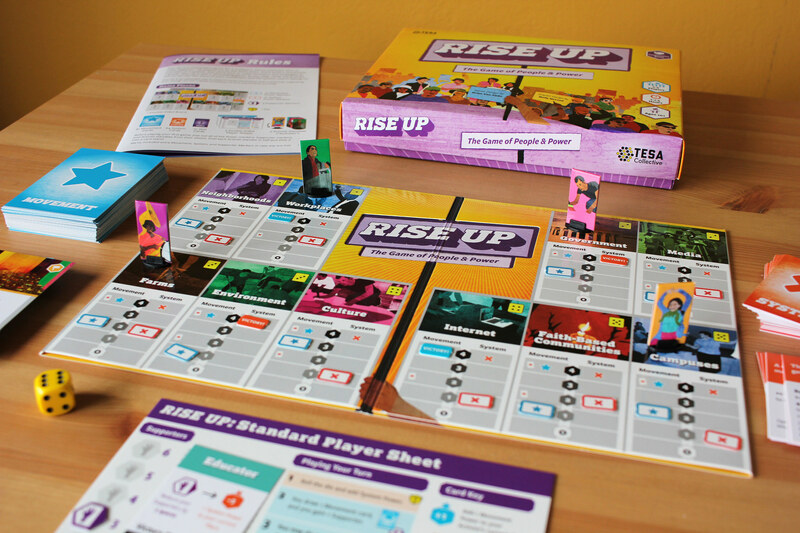 Rise Up is a cooperative game, meaning all players are on the same team trying to beat the game itself. But watch out, because the game is fighting back. 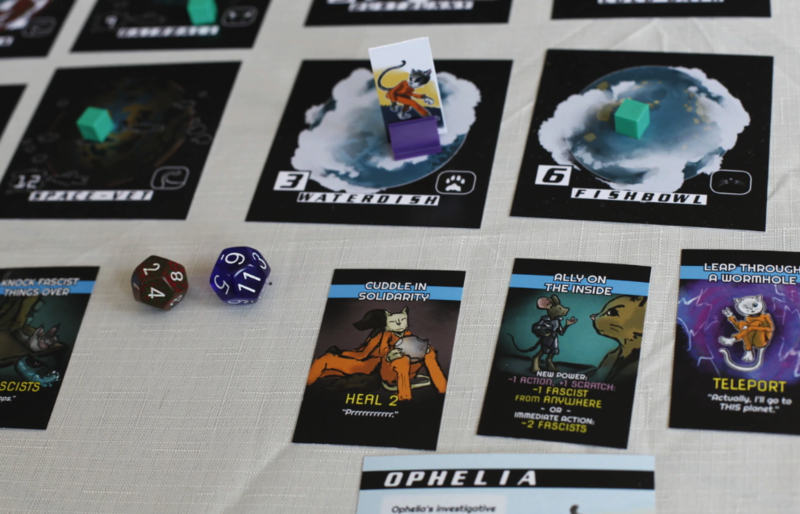 With cards like “Smear Campaign,” “Infighting,” and “Corrupt Politician,” the game will oppose players at every turn. Collaborating is the only way players can overcome all of the hurdles the game throws at them. Here’s what people are saying about Rise Up: The Game of People & Power. On top of all of that, Rise Up comes with two versions in the box. The main version of the game is great for a game night with people who like strategy games. But just flip the board over, and you’ve got a simplified version that’s meant for younger kids and educational settings. Yup. Cats. In space. Fighting fascism. Space Cats Fight Fascism is exactly what it sounds like. If you want to talk about changing the world (or the galaxy, really), but the news is feeling too overwhelming, try this game. Space Cats Fight Fascism takes on a serious subject through a silly lens. In this game, it’s the year three million, and a group known as The Rat Pack is on the rise, trying to put the galaxy under autocratic rule. But as everyone knows, cats don’t like to be caged, and they don’t like to be collared. So the feline rebellion begins. Together, you must stop the fascist rats from seizing power – while building a new galaxy where all animals are free together. Space Cats Fight Fascism is a game like no other. Since it first came out in 2011, Co-opoly: The Game of Cooperatives has become the game of the cooperative movement. A cooperative is a business or organization that is democratically owned and run by a certain group of people, like the consumers, or the workers, and so on. Co-ops are a powerful way to build a resilient economy and more just communities. Also, did we mention Co-opoly is a ton of fun? 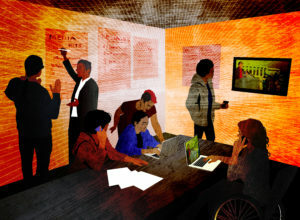 In the game, players have to work together to launch a cooperative. They must also take on the Point Bank, which will oppose them all along the way. The game is full of high-fives, laughs, and heart-pounding fun. ‘And what did the teams playing Co-opoly think of it? Co-opoly is a great choice for game nights as well as people who want to learn more about the world of co-ops. For a change of pace, check out Loud & Proud – the fast paced social justice word game! The rules are quick to learn, and the gameplay is speedy. Players face off in a circle, taking turns flipping over cards with different words and phrases. If the symbol on your card matches another player’s symbol, you face-off, and rush to answer each others’ card prompt first. Your card might say “Civil Rights Leader,” and their card might say “Renewable Energy”—the first player to correctly answer the other player’s prompt (“Rosa Parks!” or “Wind!”) wins the card. But there’s some twists and turns: A few cards force all players to give an answer at once or provide not just one, but three answers! What ensues is shouting, laughing, high-fives, and the opportunity for important conversations. Loud & Proud has a ton of replay value, and it creates a fun, raucous, and insightful time for everyone. So now that you know about these games, what are you waiting for? It’s time to get a game night together! This entry was posted in Our work, TESA News and tagged board games, cooperative games, games. Bookmark the permalink.